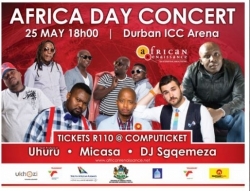 The 16th annual African Renaissance Festival will be held from the 22nd to the 25th May 2014 in Durban at the Inkosi Albert Luthuli International Convention Centre. The African Renaissance Festival 2014 is an opportunity to celebrate Africa's progress and the renewal of our continent through a number of high profile events. The annual Youth Conference will be held on the 20th May. This highly popular and well attended one day event, which is already fully subscribed, celebrates entrepreneurship while giving advice on achieving personal success. The African Renaissance Conference on the 22th and 23rd May will bring together experts and senior representatives of governments and the private sector. Africa is on the move and the theme of this year's conference is "Africa in Motion" with a focus on the maritime, aviation, tourism, media and communication sectors as well as business in Africa. The conference will provide insights into strategies, developments and challenges in South Africa and further afield. The conference is open to the public visit http://thoughtfire.co.za/africanrenaissance.aspx to register. The music concert on Sunday the 25th May at 6 pm will include you in the festivity around the unity of Africa. The Organization of African Unity was founded in 1963 and as a result, the 25 May - Africa Day- marks the day that African Heads of State and Government came together with the intention to unite Africa. 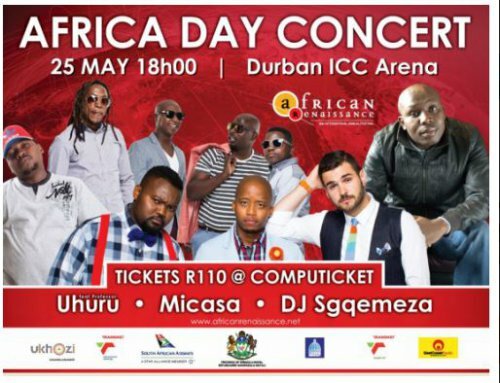 The concert which will be held at the ICC Arena will feature MiCasa, Uhuru and DJ Sgqemeza. Tickets are available from Computicket.